While dry farmed tomatoes might look a bit like "normal" tomatoes, their taste is anything but ordinary. These smaller, round, bright red fruits pack an intense, sweet flavor and a rich texture that is unmatched by store-bought tomatoes and on par with heirloom varieties in the peak of their season. In short, they are absolutely spectacular. Dry farming is a complex method of growing tomatoes that results in less overall volume, but highly flavorful fruit. After transplanting the young tomato plants into the fields, we saturate them with 3 successive waterings and then withhold irrigation once their roots have established. Doing this forces the plants to send their roots deeper into the soil to seek out water - sometimes the root systems will extend more than 5 or 6 feet. Constantly monitoring the soil and cultivating it to ensure it will retain enough moisture is vital to this technique's success - without the careful watch of our farmer and field crew, dry farming would not be possible. 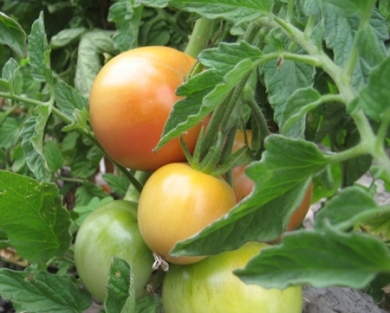 The plants slowly absorb water and nutrients, which leads to smaller, richer tomatoes. The fruits are dense with flavor and are also uninhibited by the excess juice that comes with more frequent irrigation. We harvest the tomatoes just before they are ripe, as they will become even sweeter if they spend their last few days ripening off of the vine. As the plants mature throughout the season, they produce sweeter and sweeter fruit, which is ideal for late summer canning projects. Although many different tomato varieties can be dry-farmed, we use the Early Girl variety most frequently. Our Early Girls have slightly thicker skin, with intensely red flesh. Their bright flavor - accented by a few tart notes - and rich, smooth texture make them ideal for a multitude of summer tomato dishes, from salads and salsas to sauces and soups. Never keep tomatoes in the fridge - the cold will turn their tender, flavorful flesh mealy and bland. Less ripe tomatoes will indeed brighten up on a room temprature counter-top - but try to keep them out of direct sunlight. Tomatoes are very high in vitamin C, A & K, as well as fiber and lycopene. Our Early Girls make sweet soups and sauces. They are excellent for salsas and salads since they contain less juice and will not overly saturate other ingredients. They are great with a little heat - try them sliced onto pizzas, pastry dough or toasted breads. For a quick sauce, quarter the tomatoes, toss them in olive oil and broil them for about 10 minutes, adding a little balsamic vinegar at the end. Pair with cipolline onions, basil, marjoram, or rosemary.